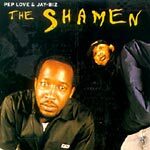 The Prose's 'The Shamen' features oldies favorites as well as unreleased old school tracks going as far back as '91 and '92 produced by members of the whole crew, and featuring guest appearances from Del and Casual. Cop that undergound Hiero shiiieeet!!!!! Don't Forget Hiero Oldies Volume 1 and2 CDs! Production: 1, 2, 5, 10, 11 by Jay Biz, 3 by A-Plus, 4 by Casual, 6, 7 & 9 by Domino, 12 by Del.